Self healing cutting mats (also known as fabric cutting boards) provide a protective cutting surface that 'magically' recovers from cuts (Source). They're generally 3 mm thick and built from layered PVC plastic with inch/metric markings as well as grid lines for orienting your crafts projects (Source). Buyers range from sewers, crafts professionals, quilters, photo croppers, and art designers. They do come in a range of sizes- some buyers have found they can unite two of them together if they want to cover a particularly​ large work surface (Source). Some buyers have experienced warping issues, which seems to be caused by temperature fluctuations- but these are rare occurrences (Source). The Dahle Vantage self-healing mat has a transparent​ option, which some buyers liked for tracing purposes. The Alvin option has the most diverse sizing options and also produces the largest available mat, which measures 96" long by 48" wide. The Alvin, Fiskars and US Art Supply mats all have hanging holes- which is a convenient storage option. The Alvin self-healing mat includes a hanging hole, is 3 mm thick and is designed for general arts and crafts work. Buyers say that it is a relatively inexpensive option that has withstood years of use. One tradesmen added some rubber shelf liners beneath it to function as grip treads to add some extra cutting stability. Overall, a solid option to consider. This self-healing cutting mat offered by Alvin is well-made, durable, multifunctional, and long-lasting. Users love the thickness of the mat, but some do note that it has a strong, unpleasant smell. 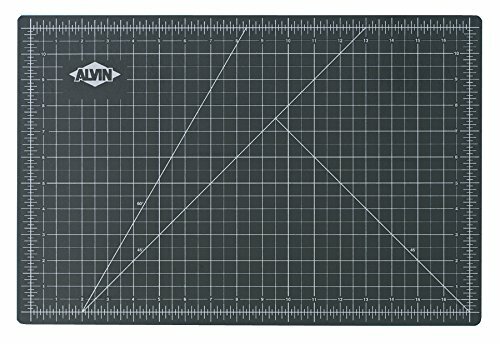 The Alvin professional cutting mat measures 12” x 18”, and it’s made from a unique vinyl material, which is specially designed for rotary and straight utility blades. Another great thing about this product is that there is a hanging hole so that you can store it easily. Moreover, thanks to the zero centering lines, you won’t have any issues finding the perfect center for your projects. A buyer commented that 12” x 18” cutting mat lived up to his expectation and that after cutting several images, there were no marks or slices on it. He highly recommends it as one of the best self-cutting mats. Another reviewer mentions that the Alvin professional cutting pad is heavy-duty and that it lies completely flat on the table. He adds that the grid lines and the measurements are very convenient and make his work easier. A user also notes that he cut the mat with an X-Acto blade and there is not a sign of damage. However, some customers have said that the self-healing pad arrived warped and that it doesn’t heal as well as they expected. Some users also note that there is a warning on the package that the mat contains chemicals that are known to cause cancer. If you are looking for a top-notched, affordable cutting mat, you might take a look at this self-healing pad offered by Fiskars. Users love the size and the durability of the mat, but some do note that there is a harsh chemical smell present. The Fiskars self-healing rotary cutting pad measures 24” x 36”, and it provides plenty of space for cutting fabrics. It features a measuring grid on either side, which is great because you can use both sides of the pad. Moreover, there are bias lines (30-, 40-, and 60-degree) so that you can create triangle and stars with ease. The self-healing mat also has a lifetime warranty. A buyer comments that he was skeptical regarding the quality of the Fiskars 24” x 36” self-healing mat, but it works far better than he anticipated. He adds that he finds the square design very useful and that the mat lies flat on the table. Another reviewer observes that the measurements are easy to see and that cutting fabrics is a pleasure. A purchaser also states this large cutting mat really heals itself and that there are no signs of damage. However, some customers have said that this rotary cutting mat wasn’t packed properly and as a result, it arrived deformed. Some also note that the pad isn’t healing and that it looks terrible after months of use. This profession self-healing mat for sewing offered by US Art Supply is handy, practical and an excellent choice for various art crafting projects. Users love that the mat has durable 5-ply self-healing construction, but some do note that it arrived folded and warped. 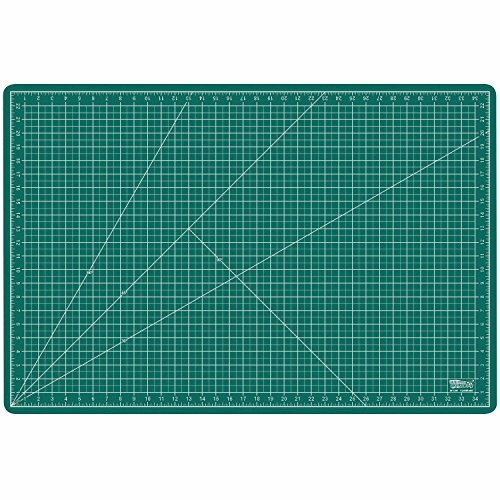 The US Art Supply professional quelling mat measures 24” x 36”, and it features a ½ “grid with 1/8”marks for precise cutting, grid markings on both sides, a non-stick surface, and black/green color. Another great thing about this pad is that it has lines for cutting diagonals and 45° and 60° guides. Moreover, it’s useful for protecting your tabletop when you’re using a sharp blade. A purchaser observes that the US Art Supply self-healing mat for sewing arrived in a flat box and that it wasn’t folded or deformed. He adds that as a graphic artist he finds it very useful and he highly recommends it as the best self-healing mat. Another reviewer states that his rotary blade doesn’t leave any marks and that the pad is thick and heavy-duty. A user mentions that he has been using the mat for quelling and that it works even better than some more expensive models. However, most customers state that the provided dimensions are wrong. They say that the self-healing mat actually measures 23” x 35” and that they feel misled by the description. If you are looking for a way to protect your table top, you might take a look at this black cutting mat offered by Dahle. Users love the thickness and the size of the mat, but some do note that there are markings only on one side. The Dahle vantage self-healing mat measures 9” x 12”, and it features 5-layer design for extra durability, a thickness of three inches to protect your work surface, and a preprinted ½” grid to make cutting easier. Another great thing about this pad is that it has scale lines for diagonal cutting and inch and metric measurements. A purchaser observes that the Dahle cutting mat has a smooth surface and that it’s very easy to cut on it. She adds that the mat is holding up pretty well and that she highly recommends it as the best cutting mat for sewing and quelling. Another reviewer mentions that the self-healing pad is the perfect size for making cards and that it doesn’t bend or warp. A buyer also states that the mat stays flat on the table and that it’s thick, durable and the measurements are easy to read. However, some customers have said that the self-healing mat is not as durable as they expected and that there are visible lines left after cutting. 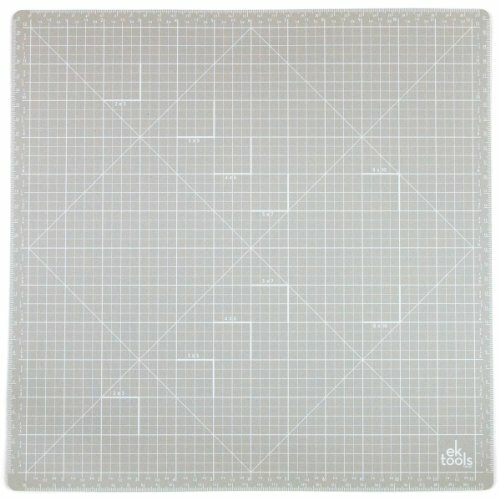 This self-healing cutting mat for quilters offered by EK Tools is affordable, durable and thick. 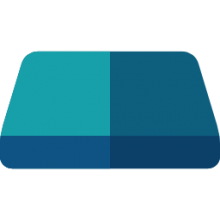 Users love the size and the price of the pad, but some do note that the measurements are located only on one side. 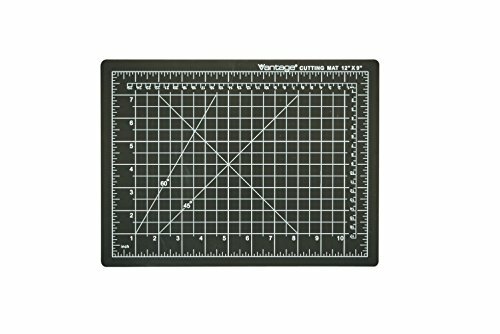 The EK Tools self-healing cutting mat measures 13” x 13”, and it features inch and metric measurements on four sides, a quick cutting guide, and 25-inch grid lines. Another great thing about this product is that it’s perfect for 12” x 12” paper and it closes immediately when you cut it. It’s recommended that you use it with retractable craft knives and rulers, which are sold separately. In general, users have a high opinion of the EK Tools self-healing cutting pad, and they praise its performance and durability. A reviewer mentions that the cutting mat doesn’t show any signs of damage after six months of regular use and that she highly recommends it as the best cutting mat for sewing. Another buyer comments that the mat is very light and easy to use and that it’s perfect for cutting straight lines. A purchaser also states that she uses rotary cutters and an X-Acto knife with no damage to this small self-healing mat and that it’s ideal for small projects. However, some customers have said that the pad arrived warp and that it’s impossible to get it flat. Some also note that it’s not self-healing at all. The first self-healing cutting mat we examined is provided by Alvin-you'll find it in a variety of different sizes including 24" x 18", 36" x 24" 80" x 40", 96" x 48" and more. They are 3 mm thick, reversible and designed to be particularly durable because of their vinyl composition that can stand up to sharp utility blades and rotary blades. Indeed, examining their promotional material, they say that you can slash and cut the mats without them ever evidencing lines or marks. A handy feature is the centering the lines, which means whatever you're working on you'll be able to figure out the perfect center of it. One buyer who had purchased a rotary cutter discovered that the included self-healing cutting mat was too small for his purposes so he went online to buy a larger alternative and ended up with this Alvin model. He tells us as opposed to other options on the market, this cutting board didn't develop gouges over time. Another reviewer who had just purchased a Dewalt workbench wanted to line the top surface of the workstation with a crafts mat. He found this option stuck to the wood, didn't slide and even provided smooth traction for a mouse he used. Other buyers found that adding some rubber to their bottoms, particularly shelf-lining style tread, helped to ensure the mat wouldn't budge as they worked on it. Other craftspeople found they could create one large work surface by uniting two of these mats together at the same time. A professional quilter who works out of her home compliments its hanging feature, its durability, and its adaptability- resisting warping without having any noxious chemical odor. Some buyers found that if you move the mat from a warm climate to a cooler one that it gets stiff. One craftsperson found that using a heat gun would make it malleable again. The second self-healing rotary cutting that we examined is provided by Fiskars- it comes in three different sizes and includes bias lines to help you orient your work projects. It's marketed towards buyers who work with fabric and they tell us that in terms of maintenance and care you can hang it up so that it doesn't get bent and wipe it down after use. Reviewers, for the most part, are satisfied with this option, telling us that it protects the wood surface of the desks that they've laid it across- though you should be careful when you are soldering that you don't end up burning the mat. Fabric cutters praise its healing abilities, the different sizes it comes in, and the helpful metrics that helps orient sewing projects. Other reviewers chimed in to say that in terms of long-term maintenance you'll want to clean it up after every use using a damp towel and digging into the cutlines that haven't immediately vanished to remove microscopic lint. The third option we examined is provided by US Art Supply- it comes with grid marks for aligning your crafts projects as well as 60° and 45° guidelines. This option is marketed towards artists, craftspeople, and even those who just want a writing surface protects the underlying desk from being damaged. One reviewer who has used it for a while tells us that he's primarily employed in conjunction with an X-Acto knife telling us that it's pretty durable but that over time you'll eventually have to replace it. Another graphic artist tells us that in shipping it's best if it's shipped flat as opposed to rolled because it can end up warping it. One buyer we interviewed was dissatisfied, telling us that they received an irregularly sized mat and that the surface had a distracting glare to it. The fourth option we examined was the Dahle Vantage cutting mat- it comes in a five different sizes and 3 different colors: black, transparent, and blue. It's built from PVC plastic- five layers of it that are designed to resist rotary cutters, sharp calligraphy instruments, X-Acto knives- really anything at all. 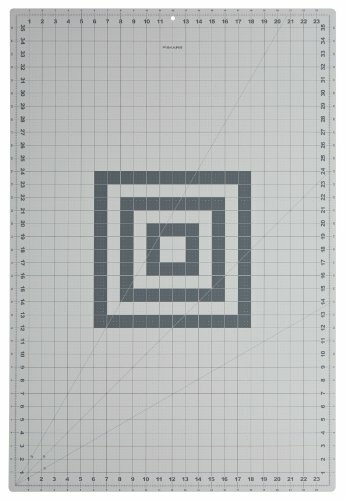 As with the other mats, it has grid lines as well as scale lines to help orient your sewing, quilting and other craft projects. They provide a helpful overview of the different buying criteria- you'll want to see that they are different sizes available, that it has enough sickness for your needs, a surface grid, scale lines and different measurement options. They also say that it's primary uses includes crafts, cutting, sewing and photography trimming. Buyers were impressed with this inexpensive option, telling us that it is a smooth and sturdy solution that ships true to size, unlike other options we've seen that sometimes arrive irregularly shaped. Reviewers concur that it provides a smooth cutting experience as opposed to some other options that have a hard and brittle feel to their surfaces. The last option we examined is provided by Ek Tools. It's marketed towards craftsmen who commonly use retractable craft knives. Reviewers are impressed, for the most part, saying that even after a year's worth of use with X-Acto knives they can't find any markings on it. A professional tells us that she invested in a high-quality cutter and mat to perform straight line cuts- she praised the functionality of this lightweight option saying that it has healed well and is simple to operate.